Cow 715 by Jazz. Pictured at ten years of age nursing her ninth calf. We have five daughters and ten granddaughters including our fall calves. 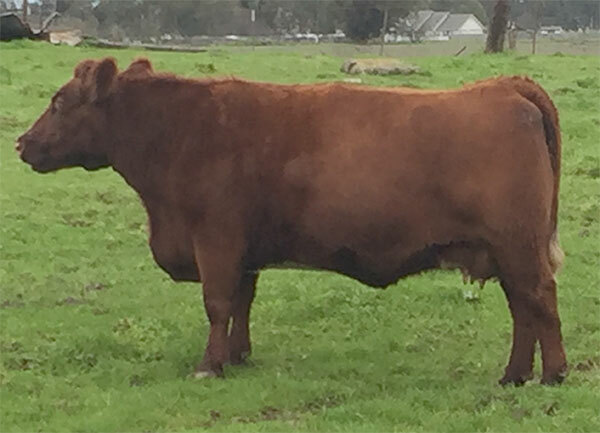 SHORTHORN HERITAGE – Shorthorns have been a favored breed of our family since the early 1970s. My first Shorthorn female was purchased in 1972 at the annual state association sale as the beginning of my FFA project. At that time, I was strictly looking for a FFA project, and had no other plans other than just wanting to own more cattle. By 1979, our herd had grown to nearly 70 cows. In college, I began to learn more about genetic selection to improve production traits. A FOUNDATION ON BREED IMPROVEMENT – After college graduation and accepting a job as a high school agriculture education teacher I decided that it was time to focus less on quantity and more on quality. As the years passed I became intrigued with the use of EPD’s and began to use them as part of my selection process. Though I have always enjoyed viewing cattle at shows I often struggle to understand why some are willing to accept cattle that are not structurally sound. I have attempted to develop Keystone Shorthorn cattle to be structurally sound, high performing and moderate in birth weight. I feel that over the years much progress has been made to that end. KEYSTONE SHORTHORNS: A FIRM YOU CAN TRUST. For many years I have partnered with the Albiani Family because we share common goals. Together we try to produce cattle that we are proud of and will work for our customers in the show ring and more importantly in the pasture. I would enjoy discussing your vision for producing quality shorthorn cattle and would love to show you that progress that we have made to that end.